CORDURA® brand is hitting the ground running in 2019 with trailblazing innovations including the new Beyond Clothing collaboration powered by CORDURA® nylon 6,6 fiber technology. The library of trend-setting CORDURA® fabrics including the latest ISPO TEXTRENDS winners will also be available for sampling: technical mid-layer fabrics for the active outdoors; sustainable textiles for bags, packs and accessories; lightweight outer layer apparel solutions; and futuristic fabrics for footwear. More info. Chemours introduces Zelan™ R2 PLUS finish, a bluesign® approved, non-fluorinated, bio-based, renewably sourced DWR finish branded as Teflon™ Eco Dry finish. 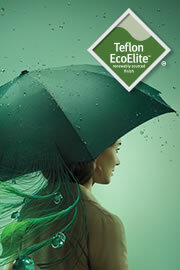 This new product joins Teflon EcoElite™, one of the best-performing non-fluorinated DWR finishes on the market today. We're building a new kind of chemistry companyâ€”one that balances the essentials of life with a commitment to produce responsible products to meet the demands of a changing world. More info. 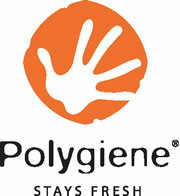 Polygiene® Stays Fresh Technology makes your products Stay Fresh, and you can enjoy fresh-all-day confidence. You can also wear your products more and wash them less, saving you time, water and energy associated with washing. POLYGIENE – SWEAT WITHOUT SWEATING IT! Based on natural silver salt made from 100% recycled silver, Polygiene is permanently applied to each product, helping you Stay Fresh and feel confident when you're working hard on the trail, in the backcountry or around town. More info. Draper Knitting is excited to launch their "small minimum, short lead time, in-stock wool program" affectionately referred to as The Wool Bar! There will be 2 weights (base layer and mid weight) of each of the following constructions, jersey, rib and interlock as well as 5 weights of pile fabric with a 21.5 micron "merino" wool face and a REPREVE® back yarn. If you are interested in woolâ€¦ The Wool Bar is the place for you! More info. 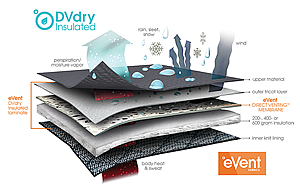 eVent® brings all-weather comfort to footwear with its new insulated laminate â€“ DVdry insulated. It features eVent's acclaimed Direct Venting (DV) air permeable technology, which has billions of microscopic pores that instantly vent body heat and sweat through a 100% waterproof membrane. The entirely US-made four-layer laminate combines a 200-, 400- or 600- gram insulated layer with the eVent membrane to equip footwear with an unrivaled combination of warmth, breathable comfort and year-round, all-weather waterproof protection. More info.